Born in Sweden, Captain William Matson (1849–1917) arrived in San Francisco in 1867, at the age of 16. There, he began sailing in San Francisco Bay and northern California rivers. Captain Matson became acquainted with the JD Spreckels family and was asked to serve as skipper on the Spreckels yacht, Lurline. The Spreckels family later assisted Captain Matson in obtaining his first ship, the Emma Claudina. In 1882, when Matson sailed his three-masted schooner Emma Claudina from San Francisco to Hilo, carrying 300 tons of food, plantation supplies and general merchandise, Matson Navigation Company started its long association with Hawai‘i. In 1887, Captain Matson sold the Emma Claudina and acquired the 150-foot brigantine Lurline from his employer, JD Spreckels – this was the first of several famous Matson vessels to bear the name Lurline. Matson met his future wife, Lillie Low, on a yacht voyage he captained to Hawai‘i; the couple named their daughter Lurline Berenice Matson. As the Matson fleet expanded, new vessels introduced some dramatic maritime innovations. The bark ‘Rhoderick Dhu’ was the first ship to have a cold storage plant and electric lights. The first Matson steamship, the ‘Enterprise,’ was the first offshore ship in the Pacific to burn oil instead of coal. Increased commerce brought a corresponding interest in Hawai‘i as a tourist attraction. The second Lurline, with accommodations for 51 passengers, joined the fleet in 1908. The 146-passenger ship SS Wilhelmina followed in 1910, rivaling the finest passenger ships serving the Atlantic routes. More steamships continued to join the fleet. When Captain Matson died in 1917 at 67, the Matson fleet comprised 14 of the largest, fastest and most modern ships in the Pacific passenger-freight service. When World War I broke out, most of the Matson fleet was requisitioned by the government as troopships and military cargo carriers. Other Matson vessels continued to serve Hawai‘i’s needs throughout the war. After the war, Matson ships reverted to civilian duty and the steamers Manulani and Manukai were added to the fleet – the largest freighters in the Pacific at that time. The decade from the mid-1920s to mid-1930s marked a significant period of Matson expansion. In 1925, the company established Matson Terminals, Inc., a wholly owned subsidiary, to perform stevedoring and terminal services for its fleet. With increasing passenger traffic to Hawai‘i, Matson built a world-class luxury liner, the SS Malolo, in 1927. At the time, the Malolo was the fastest ship in the Pacific, cruising at 22 knots. Its success led to the construction of the luxury liners Mariposa, Monterey and Lurline between 1930 and 1932. Matson’s famed “white ships” were instrumental in the development of tourism in Hawai‘i. In addition, beginning in 1927, with the construction of the Royal Hawaiian Hotel, Matson’s Waikīkī hotels provided tourists with luxury accommodations both ashore and afloat. Immediately after the December 7, 1941 attack on Pearl Harbor, the passenger liners Lurline, Matsonia, Mariposa and Monterey, and 33 Matson freighters were called to military service. Matson, as General Agent for the War Shipping Administration, was given the responsibility for manning, provisioning, maintaining and servicing an important part of the government’s rapidly expanding fleet of cargo vessels. Matson was soon operating a fleet of more than one hundred vessels. Two new Matson hotels were built on Waikiki in the 1950s, the Surfrider in 1951 and the Princess Kaʻiulani in 1955. In 1955, Matson undertook a $60-million shipbuilding program which produced the South Pacific liners Mariposa and Monterey, and the rebuilt wartime Monterey was renamed Matsonia and entered the Pacific Coast and Hawai‘i service. On August 31, 1958, Matson’s SS Hawaiian Merchant departed San Francisco Bay carrying 20 24-foot containers on deck. The historic voyage marked the beginning of an ambitious containerization program that achieved tremendous gains in productivity and efficiency from the age-old methods of break-bulk cargo handling. The container freight system that Matson introduced to Hawai‘i in 1958 was a product of years of careful research and resulted in the development of a number of industry innovations that became models worldwide. Containerization brought the greatest changes to water transportation since steamships replaced sailing vessels. Concurrently, shore side innovations were introduced, including the world’s first A-frame gantry crane, which was erected in 1959 in Alameda, California and became the prototype for container cranes. In 1959 (the year Hawai‘i entered statehood and jet airline travel was initiated to the State,) Matson sold all of its Hawaiʻi hotel properties to the Sheraton hotel chain. 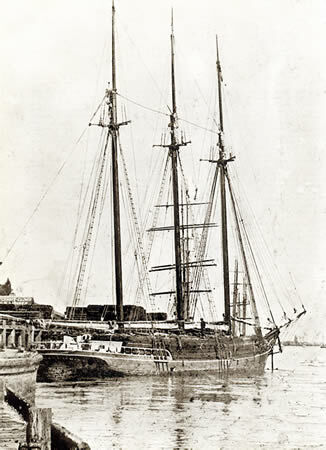 The image shows the three-masted schooner Emma Claudina that entered Hilo Bay in the early dawn of April 23, 1882 – setting the stage for a long relationship between Matson Navigation Company and Hawai‘i. In addition, I have added other images of Matson’s ships and related items in a folder of like name in the Photos section on my Facebook and Google+ pages.